When I’m in Rome, I usually do as Romans and other Italians do and breakfast on milky espresso, fruit, and carbohydrates in the form of pastry, toast, or biscuits (cookies). But occasionally I yearn for a good old Anglo-Saxon breakfast of eggs and bacon. Sometimes these breakfasts come from the American south with fried green tomatoes and grits. At others, they hail from Britain with grilled ripe tomatoes and tea. I love eggs. My Aunt Marjorie kept chickens, and it thrilled me as a child to reach into the hens’ nests and retrieve eggs, still warm from the oviduct. I waited expectantly for the next morning’s scrambled eggs and licked my lips with gusto. As a member of the 4-H Club a few years later, I found myself on an egg judging team. We visited commercial chicken houses and small farms with open pens, learned how to determine an egg’s freshness by floating it in water, and examined the eggs emptied onto a saucer to determine their quality. I learned a lot about eggs. As my life carried me to urban areas where I got my eggs from supermarkets, I still enjoyed my egg salad and scrambled eggs and omelets. But I didn’t realize for years that the intensity of the taste I had enjoyed as a child had diminished. Then I began eating eggs from happy chickens raised by friends on Maryland’s Eastern Shore. These chickens scratched in the dirt and nibbled on grass and other vegetation in the chicken pen. Their eggs burst with a flavor that took me back to Aunt Marjorie’s hen house. The doorkeeper of my apartment building, one mile north of the White House, always laughed when my friend arrived with a couple of dozen eggs under her arm. He didn’t get it. When I moved to Rome in 2002, I noticed the vivid color of egg yolks right away; it’s a deep orange. In fact, the usual word for egg yolk in Italian is il rosso—the red. And the flavor, even of the supermarket variety, is even more powerful than those from the Eastern Shore. I bought my first eggs here from an elderly couple at the market. They sold only eggs, arranged in a basket on a makeshift table behind their car. You could buy however many you wanted—even one. They would wrap the eggs in brown paper and hand them over with a smile. I soon noticed that most eggs on sale in Italy were stamped with an eleven-digit code. I learned that this derives from European Union regulations that require eggs to wear a coded label showing how the chickens were raised, the country of origin, and the individual producer. 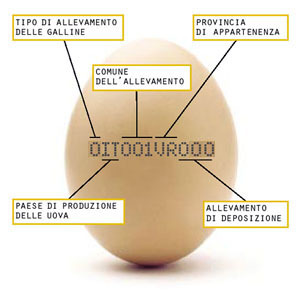 Italian regulations are more stringent in that they also require each egg to identify the province and commune (political jurisdiction) of origin. Individual producers selling directly to their customers do not have to label their eggs. The regulations about how the chickens are raised are very specific. Organic eggs, for example, must come from chickens raised in the open with ample vegetation and at least ten square meters of ground per hen. That’s a lot of space. On the other hand, chickens grown in cages must be in spaces of no more than twenty-five hens per square meter with roosts of at least fifteen centimeters per hen. That’s a very small space indeed. The economics of egg production is clear. In the space required for one organic egg per day, producers can obtain 250 caged eggs. This morning, as I dipped my spoon into a soft boiled egg, the deep orange yolk dribbled down onto the porcelain egg cup. I scraped it off with my spoon, then licked the liquid gold with my tongue. This treasure costs five times as much as the eggs in my fridge waiting to become cake batter. It’s worth every centesimo. 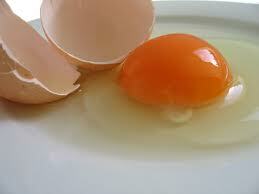 I've also noticed that the eggs in Iran have orange yolks as do some of the organic ones I by here in California. Eating soft-boiled eggs out of an egg cup like the one in your picture always reminds me of breakfasts in Germany. My cousins always eat their morning eggs that way. I think that color is accompanied by flavor!